Toru TAKASUKA, known as a very few Japanese entrepreneur challenging in US internet market by his Lunarr (covered on TechCrunch, Mashable, and a lot more), invites popular bloggers from US for one week Tokyo and Japan web technology meetings trip. 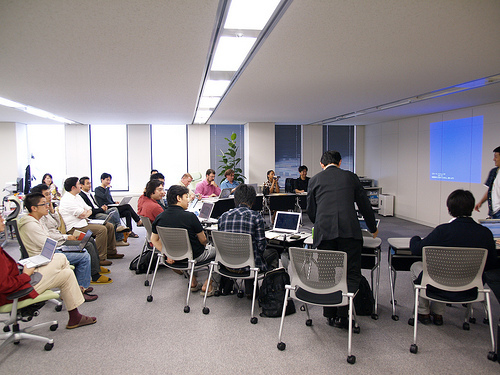 I am luckily able to attend one of their meeting, because it was held at my workplace Cybozu Labs. 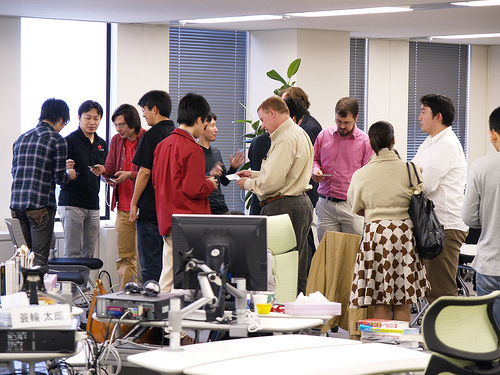 There were 4 Japanese entrepreneurs had a chance to make a 10 minutes presentation each to those bloggers. Tomonari SONODA, CEO of Utagoe, recently moved to San Jose, introduced their new frontend service Channel.is . Their P2P movie broadcasting system and its selling URL under channel.is as a short name of broadcasted movie page. Also, new live video RSS service is being released today. Ryo SHIMIZU, CEO of Ubiquitous Entertainment Inc. talked on his making Niconico Douga and iPhone application. Ken SUZUKI from Sargasso introduced their services, Nota, CShirts. Hatena’s exective Yuichi KAWASAKI talked 3 services, Hatena Haiku (on Asiajin), Hatena Diary and Hatena Bookmark, their successful Japanese services. Consultant Tatsuya KUROSAKA made a short speech around his activities, being a freelance in Japan and web future for long-term, etc. My Cybozu Labs colleague Kazuho OKU, who developped Xiino browser for Palm, made a jump-in presentation on Japanize/MyLingual, automatic menu translation services supported by user generated data. Also, Pathtraq, web traffice analysis service was expained. Currently it is targetting Japanese web, and you get good hot news list on it which cannot be searched on traditional search engine (which does not concentrate on “emerging news last hours”). Some of those services could be mentioned by those bloggers soon, I guess. [disclaimer] Akky AKIMOTO works 3 days per week for Cybozu Labs as a company blogger (in Japanese). Lunarr’s Toru TAKASUKA is a former CEO of Cybozu, though he left Cybozu years ago with selling his all stocks to start Lunarr in Portland, Oregon USA. Akky AKIMOTO has been working for Cybozu group for years and has ever worked under him when he was in charge of Cybozu US development.